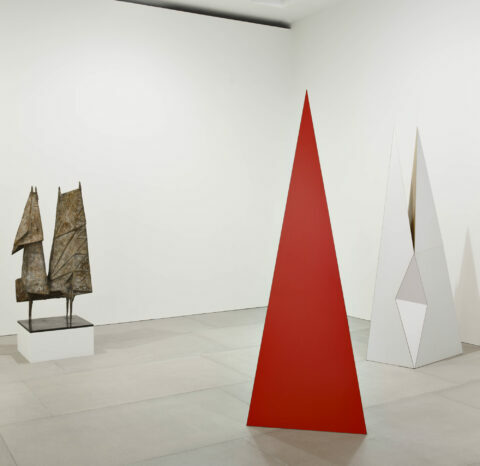 Lynn Chadwick (1914-2003 Born in London, UK) was one of the leading British sculptors of post-war Britain, known primarily for metal works often inspired by the human form and the natural world, but which also at times seemed close to abstraction. He was born in Barnes, London in 1914 and died at his home Lypiatt Park, Gloucestershire, in 2003, aged 88. The National Trust and Blain|Southern present Lynn Chadwick at Cliveden, an exhibition of sculptures by the internationally renowned British artist, Lynn Chadwick (1914-2003). 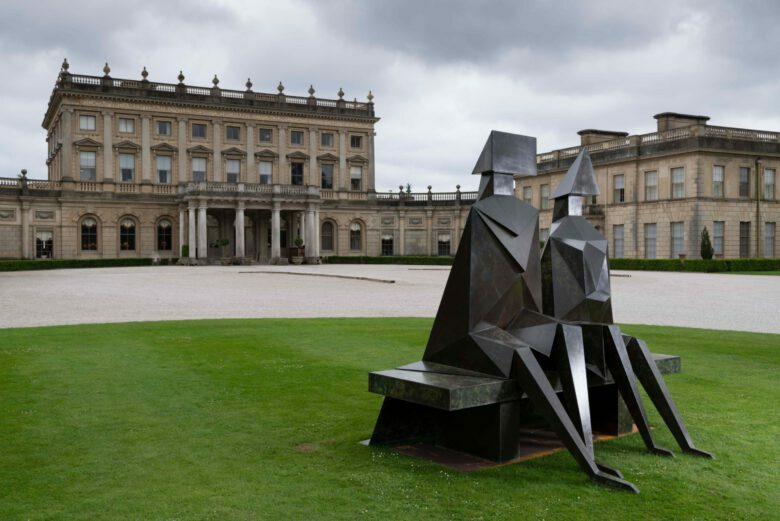 Lynn Chadwick was launched on the international stage as one of a new generation of British sculptors exhibiting at the British Pavilion of the 1952 Venice Biennale. Here these young sculptors surprised the audience with their departure from previously dominant sculptural traditions (such as carving) and materials (such as marble, wood or stone), embracing iron structures, plaster filler and industrial compounds. They presented jagged works concerned with the dematerialisation of mass and the vitality of line. When Lynn Chadwick was awarded the coveted prize for sculpture in the 1956 Venice Biennale, it was the sensation of the show and he became the youngest sculptor ever to do so. Chadwick went on to secure an international reputation, and in 1964 was appointed Commander, Order of the British Empire (CBE) in the New Year Honours List. His sculptures and drawings are in the collections of many of the great museums of the world. 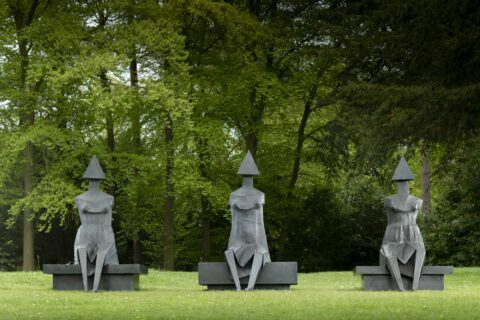 Lynn Chadwick’s career as a sculptor spanned almost 50 years, but he did not begin until he was nearly 32. He came to sculpture by an unconventional route. He did not attend Art School but began his career in an architect’s office as a draughtsman. After war service as a pilot in the Fleet Air Arm of The Royal Navy (1941-44), he returned to his pre-1939 career with his old employer, the London architect, Rodney Thomas. Chadwick’s route to sculpture was through exhibition design – work which involved construction. With the encouragement of Thomas, Chadwick created objects in which linked, balanced forms floated freely in space and were suspended from the ceiling – his first mobiles. Very few of these early mobiles survive; they were made of wire, balsa wood and cut copper and brass shapes, often fish like and sometimes coloured and they were incorporated as decorative features in the exhibition stand. Later, he developed ground supports for the mobiles, transforming them into stabiles. At the same time he was designing fabrics and furniture. With his modest income from fabric and exhibition design, he was able to become self-employed and move from London to Gloucestershire in 1946 aged 32. He was much more content in the country. It was here that he met many people who influenced his future, such as the owners of the Gimpel Fils gallery in London, where his first mobile was shown in their window in 1949. His first successful one-man show was in 1950 when he was 36. Further commissions, including a work called Cypress, for the Festival of Britain in 1951, required him to work on a larger scale and in metal. 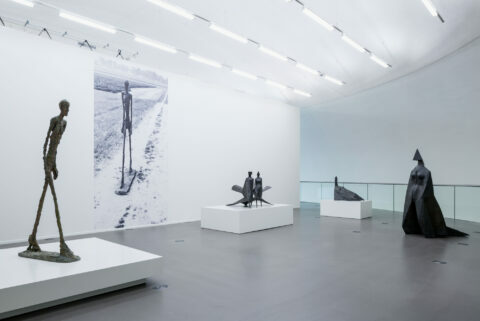 During this period Chadwick was increasingly concerned with the ground supports of the stabiles which were more sculptural, and eventually these became the sculptures without any mobile elements. He had to learn to weld and master, through trial and error, many new techniques in order to find an architectural or engineering solution to the construction of mobiles and sculptures. He was a constructor rather than a carver and did not use clay or other modelling materials. “I have never really been attracted towards clay as a material to work with because it’s too nebulous to me and it’s too soft. I can’t think of any shape that clay ought to be, I mean it can be any shape therefore I don’t know what to do with it. Whereas , if I make my constructions which are made out of iron and straight lines, I can do a drawing, a three-dimensional drawing, in this material, which has a very definite shape”Lynn Chadwick, British Library National Sound Archive, 1995. The characteristics of a Chadwick sculpture - form, stance, line, balance and attitude - are arrived at through his unique method of working. An architect might draw lines on a page; Chadwick developed a technique of taking steel rods and welding them together in space to criss-cross, join and radiate out, which formed three-dimensional shapes in space (armatures) akin to the architect’s space frame. He tended not to do a sketch beforehand – his sketches in his workbook came after the work was completed, as a record of what he had created. This armature, formed by the welded rods, was filled with an industrial compound called Stolit, a mixture of iron filings and plaster that could be applied wet and, when dry, chased to achieve the surface Chadwick desired - sometimes textured, sometimes smooth – a skin, as it were, but with the original rods still visible. He often described his sculptures as being like crabs with their bones on the outside. This external armature was to define Chadwick’s imagery. Chadwick worked alone when welding and only occasionally had assistants to help with the larger works when filling in the armature. This was a laborious and time consuming process and vulnerable to changes in humidity which caused the sculptures to distort and fracture in many cases. Should a sculpture get damaged, have a bent leg or perhaps lean, the “attitude”, crucial to Chadwick, was lost. “The important thing in my figures is always the attitude – what the figures are expressing through their actual stance. They talk, as it were, and this is something a lot of people don’t understand”. Barrie Gavin interviews, ‘Chadwick’ HTV West, 1991. Although Chadwick continued to construct his sculptures by this method, in the late 1950s he decided to cast them in the more durable medium of bronze, which also allowed him to expand his practice from unique sculptures into editions. The surfaces of the casts were then treated to achieve the subtlety of colour Chadwick was searching for with each theme he was working on – sometimes golden, sometimes grey. Later he also cast in silver and gold. “If I look back on my work over a period of years, I can see a development from mobiles and constructions, on to beaten shapes with limbs and connections, to the solid forms on which I’m now working. 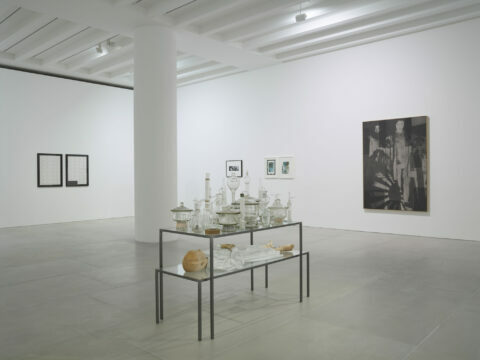 It seems there has been a deliberate continuity, as if the mobiles have been a research into space and volume (separate parts free in space), and the constructions had been a way of joining the parts together, fixing them in space to make forms, and that these constructions have become armatures for the solid shapes – the iron frames of the construction still delineate the mass and act as lines of tension”. In the 1960’s, Chadwick became interested in both the abstract form (back to basic principles) and looking at the human form – and later looking in detail at how a figure moves and the stances they might take. During the 1970’s and 1980’s he started to standardise these figures. He developed a sort of visual code – eventually most of the male figures had rectangular heads and the females had triangular heads (or flowing hair as in High Wind). Even at its most abstract and geometric there is usually an allusion to natural forms in Chadwick’s work that underpins and gives vitality to it. There is movement too: explicit in mobiles and stabiles and implied rather than overt, in Winged Figures, High Wind and many others. Chadwick mainly created single or paired figures, but on occasion groups of three figures. In order to appreciate the “attitude” of the sculptures, they also need to be displayed at the correct height – for Chadwick the head of a figure should be approximately at eye height. 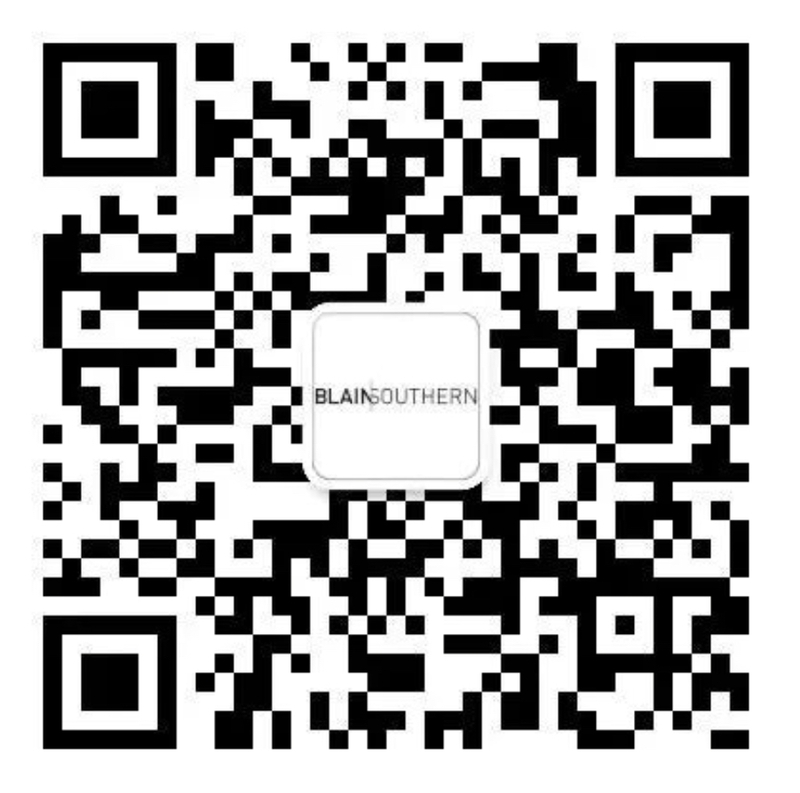 The figures interact with each other but also with the viewer of the sculpture. 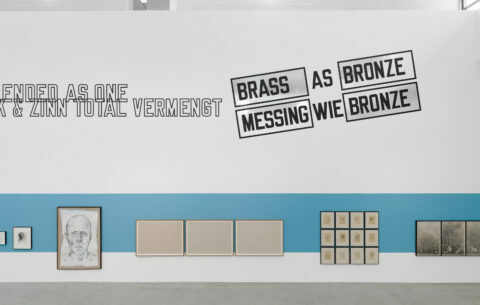 What is surprising looking at all his work is how personal it remains, and how timeless – these works always have the ability to say something to new audiences.